Are you looking for a small pool table that’s close to the real thing quality wise? Give this review a chance and you might realize that the HLC 55” Folding Space Saver Pool Table is the answer to your need. This table is carefully designed to look and feel like a professional pool table that’s scaled down to fit tight spaces. 3 What makes the HLC 55” Folding Space Saver Pool Table the best small pool table? Have you been wanting a pool table of your own but d﻿on’t have enou﻿gh space to accommodate a regular sized table? Well, let me introduce you to the HLC 55” Folding Space Saver Pool Table. This billiard table is one that you most definitely need to check out. This table does the job, and will surely be a hit among family and friends. What makes the HLC 55” Folding Space Saver Pool Table the best small pool table? Marvel in the physique of the HLC Space Saver Pool Table. Looking very royal in blue felt. Storage is no problem too thanks to its foldable legs. It will easily fit under the bed or inside a closet. 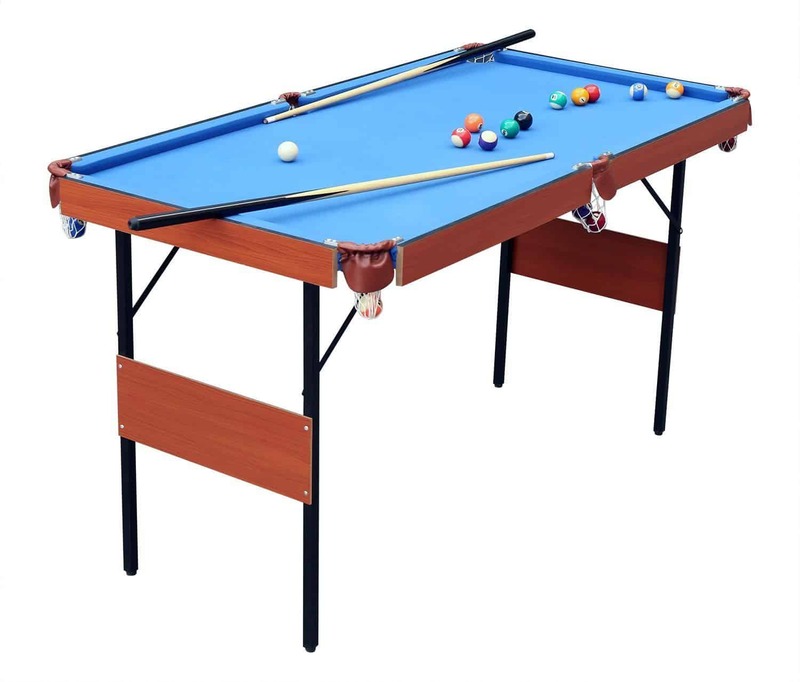 HLC 55” Folding Space Saver Pool Table is designed to be durable and functional at the same time. It is made from solid wood, thus giving you the assurance that it will last for a long time. Even the accessories that come with it are of good quality. The 2 pool cues which comes with the package are also made of solid wood. If you want a table to play with that’s close to the real thing (at least quality wise) then there’s no better table for you than the HLC 55” Folding Space Saver Pool Table. What makes this table special is that it is made of solid wood. 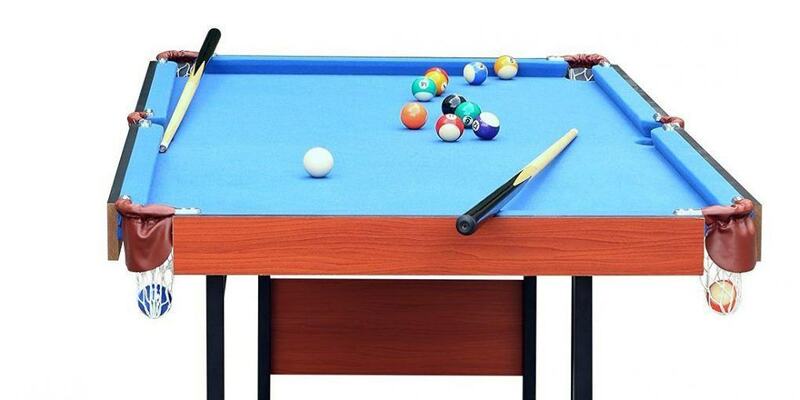 Manufacturers have tagged it as an “authentic miniature pool table”. The HLC 55” Folding Space Saver Pool Table has 53% 5-star rating, 27% 4-star rating and 20% 3-star rating. The average overall rating value for the table stands at 3.9 out of the possible 5 stars.